As an examiner who gives a significant number of practical tests every year, I see some of the same errors over and over. Being prepared for a test takes a lot of work, but some extra focus on a few of these areas can reduce the chances a student’s test will end the bad way. The following are a few very common things I see that result in notices of disapproval on multiple practical tests every year. Getting lost. It seems improbable, but many times a year I see people get lost during their practical tests. A pilot should remain cognizant at all times of their position and able to navigate back to the airport they started at without incurring any other airspaces along the way using charts not GPS to get home). Short-field landings. 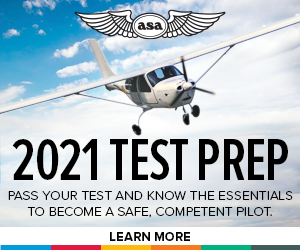 Test standards require a pilot be able to perform short-field landings to a point without being short and within a specified distance beyond the point for each test. Landing short of or excessively beyond the point is something that causes pilots to regularly fail tests. Know the standard, be able to perform to the standard, and be willing to go-around if you aren’t going to land within the standard. Soft-field takeoffs. Even though many pilots have never landed on grass or other soft-field conditions, pilots must demonstrate the maneuver on multiple tests. Many pilots are unable to demonstrate a soft-field takeoff, in many cases they’ll even accidentally strike the tail in the process. This will always result in an automatic failure. Busting airspace. This relates to getting lost, but it also stretches to knowing airspace implications and limitations. While I say busting airspace commonly is a failure point, it is probably best described as “almost busting” airspace. An examiner won’t let you actually break the airspace, but will typically stop you just prior to the violation. I have to do this multiple times a year and it is an automatic failure. Know what airspace is in effect where you are flying, and be aware of horizontal and vertical limitations of that airspace. Knowing where you are at all times will add to the ability to avoid incurring airspace unintentionally. Incorrectly following ATC instructions. If flying at an airport or in airspace that requires coordination with ATC, failure to follow ATC instructions or coordinate with them can lead to a fast end to a test. It is equally important on the ground as it is in the air. More than a few tests have ended because an applicant could not follow or did not understand taxi instructions. Pattern and vectoring instructions are also critical. If you don’t understand or are unclear what ATC wants, ask for clarification or for them to repeat the clearance. Being humble and admitting you didn’t understand is always better than ending up where you aren’t supposed to be or incurring other traffic. The best advice I can always give is to write it down. Even the best of us forget what ATC said, but having it written down on our kneeboard can be a quick memory refresh. Not going around. No pilot flies the perfect approach every time. No, an examiner won’t allow you to go-around all day, but making a good decision on an approach and going around when landing isn’t going to be within standards shows good decision-making. Be the pilot-in-command and go around if it isn’t right. Weight and balance calculations. It is amazing how many applicants tell me, and I am not joking here, that it is OK to fly over gross weight or out of CG limitations as depicted by the manufacturer. Even more applicants do not know how to calculate weight and balance for the aircraft they bring to the test. This is a basic function that every pilot needs to have down cold to pass a practical test. Flying outside of the weight and balance limitations of the aircraft is downright unsafe in addition to being a breach of regulations. Not knowing airspace. Being able to identify airspace graphical depictions on VFR charts is required for all pilot levels. If an applicant can’t tell the difference between Class B, C, D, E, G airspaces, MOAs and restricted areas, and other depicted airspaces, an examiner cannot be confident they will be able to operate within the prescribed requirements of the airspaces. If you are unclear of what each airspace looks like, spend some more time with a chart legend and get it into your mind before you take your test. Lacking knowledge of aircraft systems. Tests will cover how systems on the aircraft operate. An examiner doesn’t expect you to be an aeronautical engineer or a mechanic who can fix the aircraft when it breaks, but they will expect you to know how the fuel system operates and how you will manage it, the effects of failures of alternator or battery systems, what to do in the event of a flaps system failure, and other systems considerations. Not being able to determine if the aircraft is airworthy. Many applicants cannot demonstrate an ability to find all required inspections have been completed. In many cases, they have never looked at the aircraft logbooks before the day of the test. Beyond this, even more applicants have difficulty when questioned about AD’s, how to find AD’s, and which ones might be applicable to the aircraft they brought, or what to do if something in the aircraft is not working properly. Further required on some tests is an understanding of what would be required to obtain a special flight permit. Jason Blair is an active single and multi-engine instructor and FAA Designated Pilot Examiner with 4,800 hours total time and 2,700 hours instruction given. He has served on several FAA/Industry aviation committees and has and continues to work with aviation associations on flight training issues. He also consults on aviation training and regulatory efforts for the general aviation industry.